The aim of this study was to test the effect of different pulse frequencies and amplitudes during gastric stimulation (GS) on gastric emptying in the rat. GS was performed in 2 groups of laparotomized rats: healthy control animals, and rats with acute diabetes. The effects of four pulse frequencies (0.5, 1, 10, 20 Hz) and three pulse amplitudes (5, 20, 40 mA) were tested. The volumes emptied from the stomach after the oro-gastric instillation of a nutrient solution were compared to those obtained in animals without GS. Intragastric pH values were assessed under basal conditions and after GS. In both groups, GS increased emptied volumes compared to conditions without stimulation (p < 0.05) for pulse frequencies above 0.5 Hz. Increases in pulse frequencies accelerated gastric emptying (p < 0.01) with a plateau at around 10 Hz. The increase in pulse amplitudes resulted in larger emptied volumes only when the pulse frequency was 1 Hz (p < 0.04) while the opposite effect was observed at 20 Hz (p < 0.04). The most effective combinations to enhance gastric emptying compared to baseline conditions were 10 Hz with 5 or 20 mA. The overall effect of GS on gastric emptying compared to baseline conditions without stimulation, was greater in diabetic than in controls rats (p < 0.05). During stimulation, intragastric pH values were not different from basal conditions during fasting or after a meal in control and diabetic rats. Although both pulse frequency and amplitude should be considered during GS, frequency appears to be the most critical point. The possibility of increasing gastric emptying by electrical stimulation in diabetic rats suggests potential clinical applications for this method. Electrical gastric stimulation (GS) might be a suitable treatment in gastroparetic patients who do not respond to prokinetic drugs and / or antiemetic drugs . However, the most effective electrical parameters for inducing gastric motor effects have not been clearly defined. Previous studies have suggested that both pulse width and frequency could be important to consider: short pulse widths below 0.5 ms stimulate the intramural nervous system  while larger pulse widths above 1.5 ms and low frequencies preferentially stimulate smooth muscles. Large pulse widths delivered with a low frequency close to the native slow wave frequency promote slow waves in healthy non-operated stomachs [3–6]. However, these stimulations do not enhance gastric motility . On the other hand, higher pulse frequencies (0.5 Hz) increase the gastric motor index without any significant effect on gastric emptying [4, 7]. A previous study in vagotomized dogs showed that the frequency of stimulation was critical by the demonstration that GS with 20 Hz induced gastric contractions and enhanced gastric emptying, while 6 Hz had no effect . The aim of this study was to investigate the effect on gastric emptying of higher pulse frequencies and amplitudes than those previously used [3–7]. 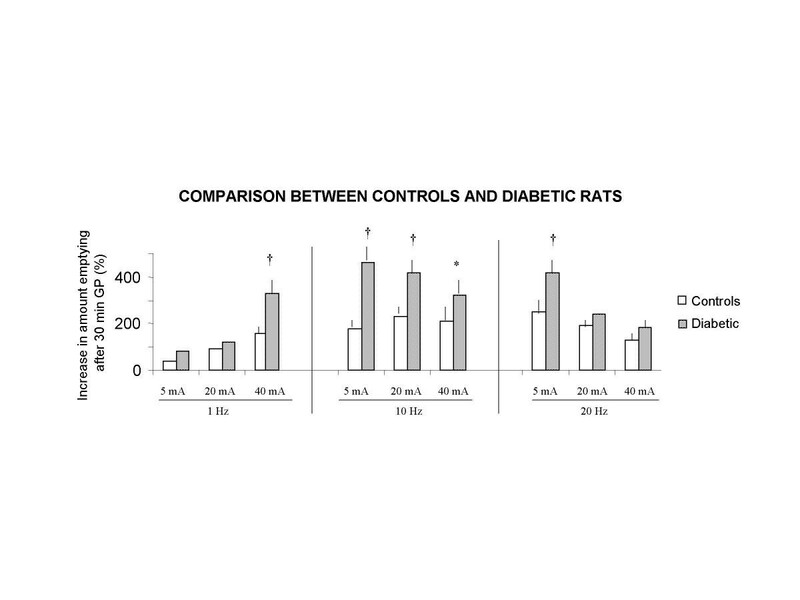 Tests were performed in two groups of rats: healthy rats with a non-operated stomach, and rats with acute diabetes, to evaluate whether GS induces a motor effect in this disease. Indeed, in diabetes mellitus, gastroparesis which could be reversed by gastric stimulation, is frequent (30 to 50% of patients) , and is associated with abnormalities in gastric myoelectrical activity such as bradygastria, tachygastria, or mixed or non specific dysrythmias . Moreover, blood glucose concentrations influence gastric motility and gastric emptying is slower during hyperglycemia than during hypoglycemia . Anaesthesia was performed in male Sprague-Dawley rats aged 3 months and weighing 250 to 300 g by intramuscular injections of 60 mg / kg Ketamine (Panpharma – France). This dose of Ketamine induces anaesthesia without any effect on gastric or intestinal transit times in dogs . Two platinium stimulating electrodes (80 μ diameter) (Microfil Industrie – Rennes – France) were implanted in the proximal part of the gastric antrum near the great curvature (figure 1), according to the method of Ruckebush et al. 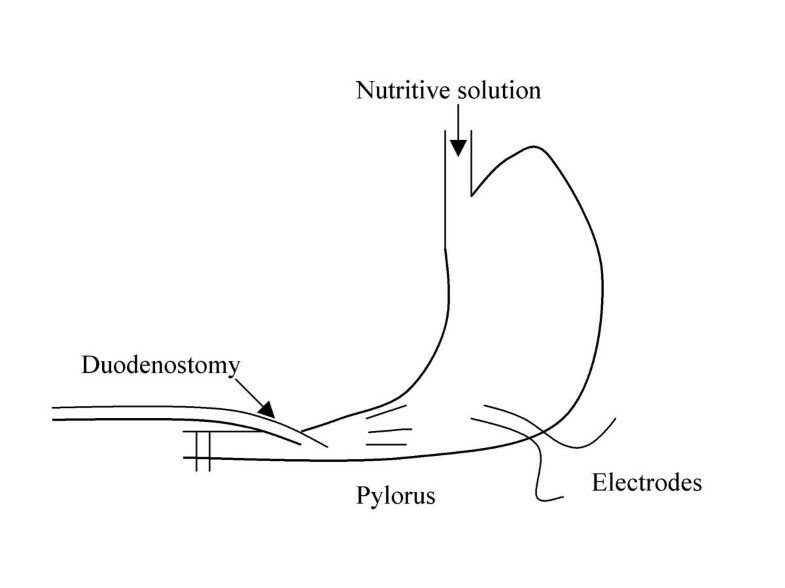 The electrodes (length : 8 cm) were positioned 1 cm away from the pylorus and were sewn 1 mm apart with 2 mm of tunnelling, and the implantation axis of the electrodes was perpendicular to the stomach axis. A terminal duodenostomy, two centimeters distal from the pylorus, was performed to collect volumes emptied from the stomach. To collect all volumes emptied from the stomach, the duodenum was immediately ligated below the duodenostomy and above the main biliary duct, and vascular and neural arcades were carefully respected. To facilitate collection of the duodenal effluent, a catheter (internal diameter : 2.5 mm) was inserted 5 mm intraluminally into the proximal part of the duodenum (figure 1). The catheter was connected to a graduated syringe (5 ml) to measure the volumes collected via the duodenostomy. These volumes were considered to be measurements of gastric emptying. Measurement accuracy was 0.1 ml. To assess the effect of pacing on post-prandial gastric motility, a 5 ml nutritient solution of Nutridoral® (carbohydrates : 50 %, proteins : 30 %, lipids : 20 %; 12.5 Kcal, Sodietal® Revel. France) was intragastrically instilled by an oro-gastric tube at a constant flow of 0.5 ml.min-1 with an automatic syringe. To study a possible effect of GS on gastric acid secreton, in other groups of rats, intragastric pH values were monitored under basal conditions and after GS (10 Hz, 20 mA). The surgical procedure was the same as previously described (terminal duodenostomy with duodenal ligature), and a pHmetric probe (Ingold M3, Solal, Strasbourg, France) was inserted in the stomach, one centimeter proximal to the antrum. The probe was connected to a pH recorder (PH 60, LT1, Paris, France). The institution's guide for the care and use of laboratory animals was followed. 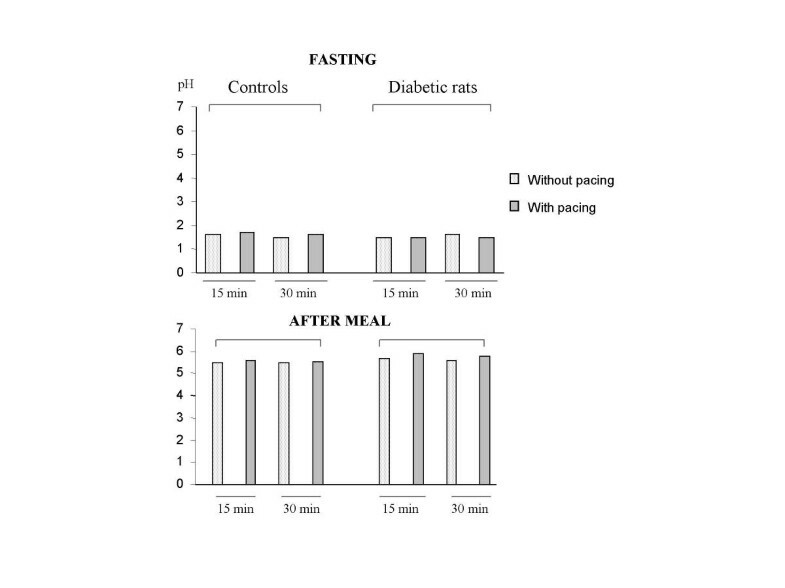 To assess intragastric pH values, 4 groups of 6 control rats (during fasting or after a meal, under basal conditons or after GS), and 4 groups of 6 diabetic rats were studied. A neuro-stimulator Respond Select® (Empi – USA) was used. This device delivers pulse trains with electrical parameters similar to those currently available with intracorporeal pacemakers. Biphasic and asymetric square pulses were used. Pulse width was selected at 0.2 ms based on previous reports showing that below 0.5 ms the main effect is nerve stimulation  and that a width of 0.2 ms is effective for intrinsic nervous stimulation of the stomach . Four pulse frequencies known to induce nerve stimulation (0.5, 1, 10, and 20 Hz) were selected . Three pulse amplitudes (5, 20, 40 mA) were applied. For each frequency (0.5, 1, 10, and 20 Hz), trains of 20 pulses at an interval of 2 seconds between each train were delivered because repetitive stimulation produces greater electrical and mechanical responses which increase gradually as the number of pulses increase . Experiments began at 2.00 p.m after an 18-hour fast and were performed in anaesthetized and laparotomized animals. One observer performed GS while another observer collected the volumes emptied through the small catheter connected to the duodenum. The observer who measured the volumes did not know whether the stomach had been stimulated or not. 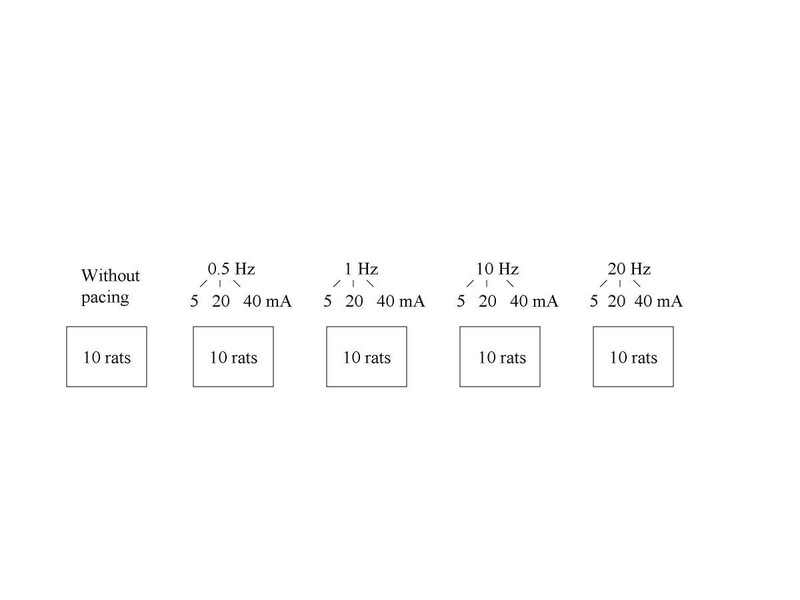 To assess the effect of electrical stimulation on gastric emptying in control and diabetic rats, the volumes emptied 15 and 30 minutes after the oro-gastric instillation were compared in 10 rats with no stimulation and 40 other rats in which GS began at the end of naso-gastric instillation (figure 2). Each rat was stimulated with one pulse frequency (0.5 Hz, 1 Hz, 10 Hz or 20 Hz) but with three pulse amplitudes (5, 20, and 40 mA) during three separate sessions of GS. Therefore, the effect of each pulse frequency was tested in groups of 10 rats (figure 2). At the end of each session of electrical GS, the electrodes and the duodenal catheter were removed and the laparotomy was closed in each animal. After awakening, animals were allowed to eat and drink ad libitum. Recovery time between sessions was 3 days. Then, on the 4th day animals were fasted for 18 hours before the next stimulation session began on the 5th day at 2 pm. Each session lasted 20 to 30 minutes and the whole procedure was a minor nuisance to the rat. None of the animals showed any significant body weight loss (> 20%), anorexia or poor body condition. 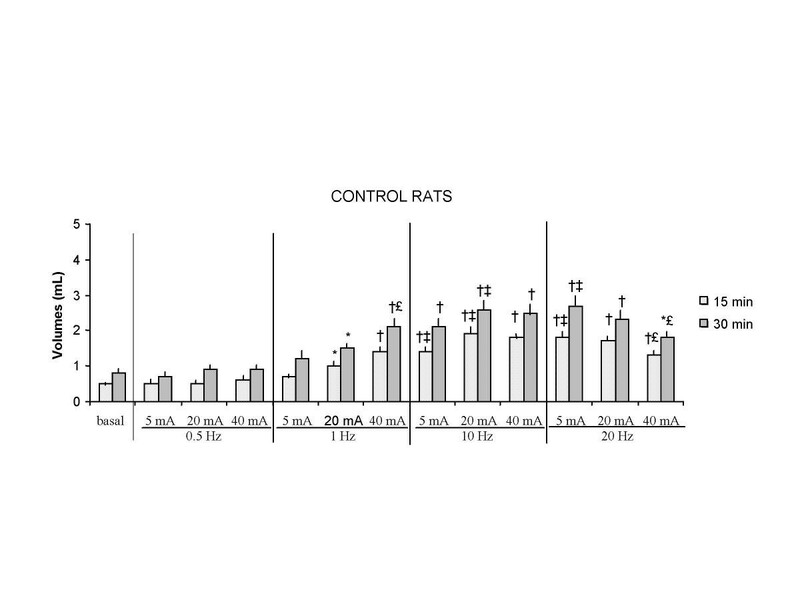 To assess the effect of stimulation (at 20 Hz, with 10 mA) on intragastric acidity, 8 groups of rats were studied. 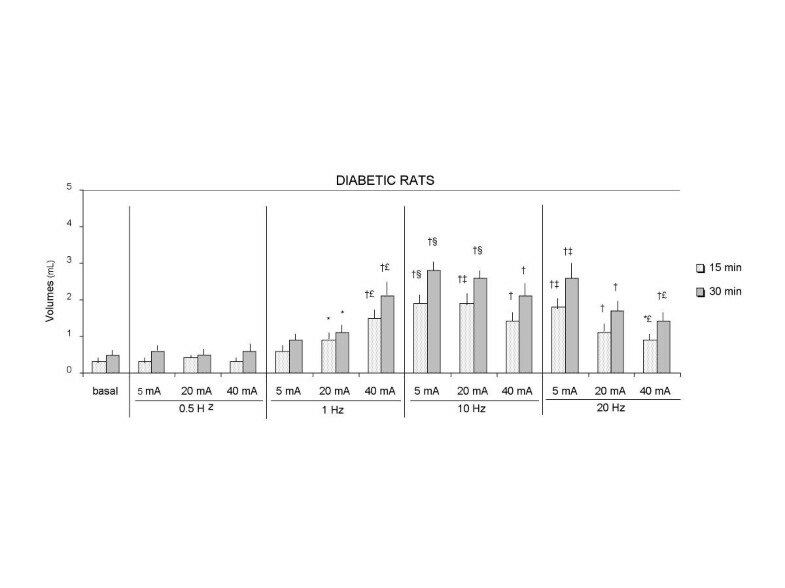 After 18 hours of fasting, pH values were assessed under basal conditions for 30 minutes in 2 groups of rats (6 controls and 6 diabetic rats), and during GS for 30 minutes in 2 other groups of rats (6 controls and 6 diabetic rats). Moreover, intragastric pH measurements were performed for 30 minutes after instillation of 5 ml Nutridoral®, under basal conditions in 2 groups of animals (6 controls and 6 diabetic rats) and after GS in 2 other groups of animals (6 controls and 6 diabetic rats). Data are means and standard error of the mean (SEM). Two way-analysis of variance (ANOVA) was used to analyse the effect of pulse frequencies and amplitudes on the volumes emptied from stomach. One way-analysis of variance was used to confirm the influence of pulse frequencies or pulse amplitudes on volumes emptied from the stomach. The Wilcoxon non parametric test was used to compare volumes emptied from the stomach: under baseline conditions compared to GS, when frequencies varied (with the same amplitude), with different amplitudes (with the same frequency), in controls compared to diabetic rats. The Wilcoxon non parametric test was also used to compare intragastric pH values in rats without GS and in rats with GS. No adverse events were observed due to GS, in particular no smooth muscle burns occurred. Two way analysis of variance (ANOVA) showed that changes in pulse frequency (p < 0.01) and in pulse amplitude (p < 0.04) affected the volumes emptied from stomach in controls and diabetic rats. In both controls and diabetic rats, volumes emptied from the stomach after electrical stimulation were greater than those without stimulation (p < 0.05), except when pulse frequency was 0.5 Hz (figures 3, 4). Moreover, the difference between the volumes collected in unstimulated rats and in rats undergoing stimulation was correlated with the duration of GS and was greater after 30 than after 15 minutes of GS (p < 0.04)..
One way analysis of variance (ANOVA) showed that larger volumes were collected from the duodenostomy as the pulse frequency increased (from 1 Hz to 20 Hz), but this effect was dependent on the pulse amplitudes being only observed for a pulse amplitude of 5 mA (p < 0.01) (figure 3). For 20 mA, volumes collected from the duodenostomy in controls were higher with 10 Hz than 1 Hz (p < 0.05). For 40 mA volumes were not different with 1 Hz, 10 Hz or 20 Hz (figure 4). For 5 and 20 mA, volumes were higher in diabetic rats with 10 Hz than 1 Hz (p < 0.03, p < 0.05) (figure 4). 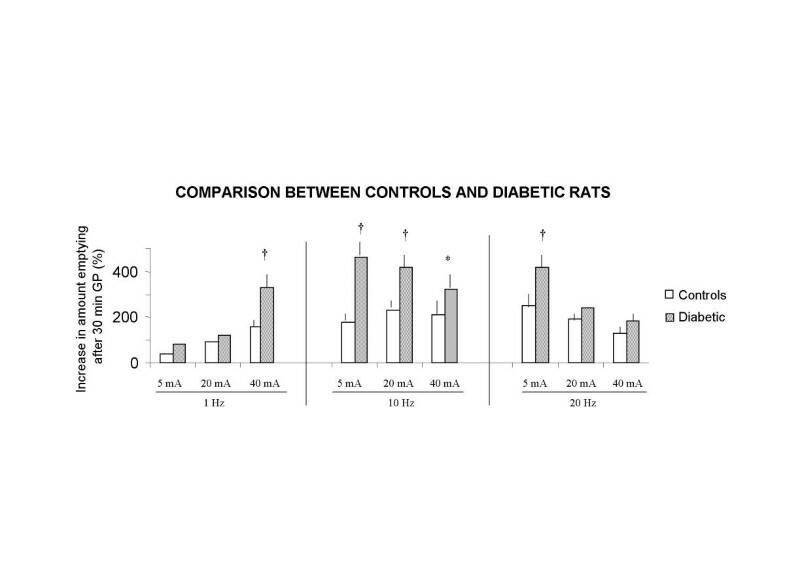 In both control and diabetic rats, the increase in pulse amplitudes had different effects on gastric emptying depending on the frequency of stimulation. One way analysis of variance showed that volumes emptied from the stomach increased when the pulse frequency was 1 Hz (p < 0.04 in control group and p < 0.03 in diabetic group), and volumes decreased when the pulse frequency was 20 Hz (p < 0.04 in control group and p < 0.03 in diabetic group) (figures 3, 4). For 10 Hz, pulse amplitudes had no influence on volumes emptied from the stomach. When pulse frequency and amplitude were evaluated simultaneously, the most effective combinations to enhance gastric emptying compared to baseline conditions without stimulation, were a frequency of 10 Hz with a pulse amplitude of 5 or 20 mA (figures 3 and 4). The effect of GS on gastric emptying compared to baseline conditions without stimulation was more pronounced in diabetic than in control rats, because emptied volumes were greater in diabetic rats that in controls, in particular with 10 Hz, with all pulse amplitudes (p < 0.05 – p < 0.01) (figure 5). 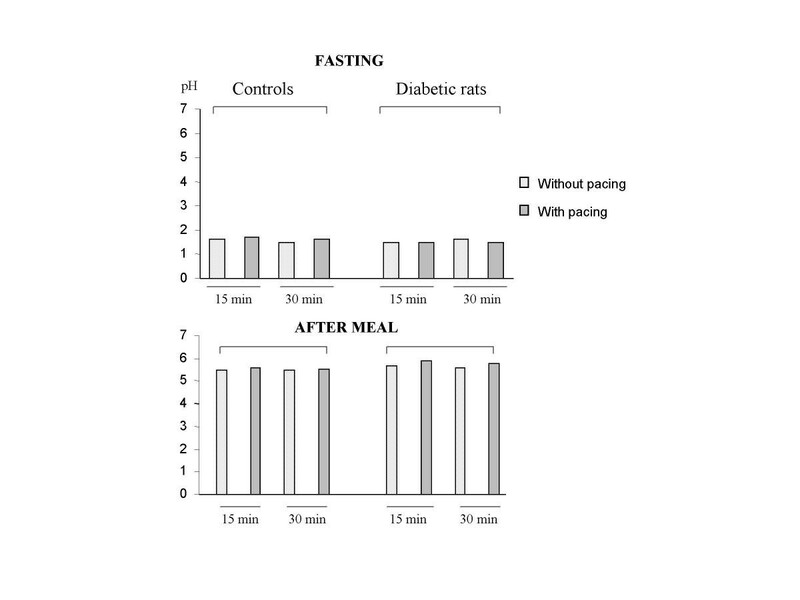 Under fasting conditions or after a meal, GS had no influence on gastric acid secretion in control or diabetic rats, whatever the pulse frequencies and the pulse amplitudes (figure 6). GS with short pulse widths and frequencies markedly higher than a spontaneous slow wave frequency enhanced gastric emptying of a liquid nutrient solution in both healthy and diabetic rats. The model of acute diabetes was chosen because recent observations indicate that hyperglycemia causes reversible impairment of gastric emptying  due to bradygastria, or less often, tachygastria or non-specific dysrythmias [10, 11]. In chronic diabetes, neurological changes including damage to the intestitial cells of Cajal also play a role in the pathogenesis of delayed gastric emptying . It could be hypothesized that a greater duodenal effluent during electrical stimulation was related to a stimulation of gastric acid secretion rather than motility and that the increased amount of liquid collected through the duodenostomy was only a reflection of increased acid secretion. However, in this study, we have checked that GS had no effect on gastric acid secretion in either control or diabetic rats, during fasting and during the post-prandial period. Although several previous studies have assessed the effect of GS on motor or myoelectric gastric patterns there are no results showing that these parameters can be modified by stimulation without having a significante effect on gastric emptying. Therefore, the objective criteria for evaluating the effects of GS was the volume of a nutrient solution emptied from the stomach and collected via a terminal duodenostomy rather than manometric or electromyographic gastric patterns [3, 4, 8]. This method was chosen to provide more objective measurement of gastric emptying than previous radiological studies  and to assess the effects of stimulation on gastric emptying. Duodenostomy eliminated the nutrient-mediated small intestine feedback in gastric emptying [18, 19]. Even if duodenostomy was performed in both unstimulated and stimulated animals so that the two groups could be compared GS may have had a less pronounced effect on gastric emptying in animals with an intact duodenum. These effects were also obtained after one single type of meal while gastric emptying is dependent on the caloric composition of the meal . Thus, our results cannot be extended to all types of meals. This study confirms that both pulse frequency and amplitude influence the effects of stimulation but that frequency seems more critical than amplitude. Indeed, a stimulation frequency faster than 0.5 Hz was necessary to modify gastric emptying. This may explain the discrepencies between our study and previous studies performed in the dog and man that used lower frequencies and concluded that GS had no effect [3, 5]. These previous studies have demonstrated that stimulation with a frequency close to that of a spontaneous gastric pacemaker only increased slow wave frequency without having any effect on gastric contractions [3, 5], motor index [4, 7] or emptying . Then, in controls, pulse frequencies ranging from 1 to 10 Hz increased volumes emptied from the stomach. The greater effect of higher frequencies confirms previous findings in vagotomized dogs  and in dogs with non-operated stomachs . This increase in pulse frequencies was also observed in man [2, 22] our study suggests that the clinical interest of increasing frequencies above 10 Hz could be limited because higher frequencies do not accelerate gastric emptying as confirmed by a lack of significant difference in emptied volumes between 10 and 20 Hz. In our study, 10 Hz, which is known to stimulate intramural nerves and have a motor effect during gastric stimulation , seemed to be the best frequency. Increments of pulse amplitude increased also gastric emptying but these effects of increments of amplitude were dependent of pulse frequencies : the increase of amplitude improved gastric emptying for frequency lower than 20 Hz while it had the opposite effect at higher frequencies. In this study, unlike others [3, 5, 21, 22], we have tested electrical parameters that stimulate intrinsic nerves [2, 15] and not smooth gastric cells. Indeed, smooth cell pacing has only been shown to modify slow wave characteristics without having any effect on antral spikes, gastric contractions, or gastric emptying [3, 5, 23]. Therefore, we selected a pulse width of less than 0.5 ms, since short pulses preferentially stimulate intramural nerves . Because of the short pulse width, electrical stimulation had to be performed at sufficiently high frequencies to obtain a motor effect . Trains of pulses were administered because with stimulation frequencies close to those selected in this study, repetitive stimulations provide a greater response than that obtained by a gradual increase in both the frequency of stimulation and the number of pulses . Twenty pulses per train were used because this has been shown to be more effective on the duration of both electrical and mechanical responses than shorter trains of pulses . Thus, because of the characteristics of the electrical parameters in this study , the mechanism involved in the acceleration of gastric emptying was probably an intrinsic neural mechanism in the gastric wall. The short width pulses used in this study require sufficient pulse amplitudes to induce a motor effect . In our animals, increases in pulse amplitude (40 mA vs 5 mA) resulted in an increase in emptied volumes at 1 Hz only. With higher pulse frequencies, the increase in pulse amplitudes resulted in a decrease in gastric emptying. This may be because a combination of high stimulation parameters (amplitude and frequency) failed to induce propagated contractions anf this failed to accelerate gastric emptying. Previous studies have reported that when pulse frequencies increase, pulse amplitudes must be decreased to obtain motor effects . Some of our increased pulse amplitudes may have produced pyloric closure in some animals when higher frequencies were used. In conclusion, GS with markedly higher pulse frequencies than those normally used (near spontaneous gastric pacemaker frequency) increased gastric emptying in control and diabetic rats. Our results indicate that increasing pulse frequencies is more effective than increasing pulse amplitudes to obtain motor effects. The safety of high frequencies during chronic stimulation in conscious animals must now be confirmed even if previous studies have used 50 Hz without adverse effects . Our results suggest that gastric stimulation in man might have greater motor effects at higher pulse frequencies than those previously used [5, 21–23]. A recent clinical study with an intracorporal stimulator using a low frequency (0.2 Hz) showed that nausea and vomiting episodes decreased in diabetic and idiopathic gastroparetic patients . The usefulness of higher pulse frequencies in man to accelerate gastric emptying and functional improvement must be clarified. GS in man may be used because no interaction has been demonstrated between gastric and cardiac pacemakers . However, further studies were needed to demonstrate the mechanisms of action of this type of high frequency GS. The authors thank Professor Jacques Benichou, biostatistician, for his valuable assistance in reviewing biostatistical results and Richard Medeiros for his advice in editing the manuscript.